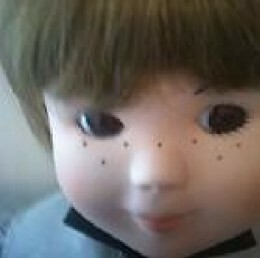 As a long term fan of creepy dolls, such as ‘Chucky’, from the Child’s Play movie franchise, and those supposedly more real, like the infamous ‘Robert the Doll’. I’ve often found a strange pleasure in perusing the ‘Haunted Dolls’ offered up for sale on eBay (of which there are many). Evil dolls possessed by malevolent spirits, and those of a kinder nature are less rare than you might previously have thought. Or at least, that’s what the numerous eBay sellers would have you believe. With Haunted dolls being listed in their hundreds. From dolls possessed by vile Demon. Through to dolls that play home to lost children, and dolls that whisper in the night. All can be found on Ebay. For a price. And while I’m smart enough to understand why eBay forces the sellers of such wares to label in small letters their items for sale, ‘for entertainment purposes only’. And would not expect to find too many ‘real-life’ Chuckys on the internets favorite auction site. You just never know. And seeing as many of these haunted dolls don’t sell for a huge amount. For a small handful of notes, I could own my very own ‘haunted doll’. Which, for right, or for wrong, was something that appealed to me. Meet ‘Lamba’ (see photo), a doll who contains the spirit of a child who in life, suffered terribly. And who now, through confusion, fear, and malice. Trapped. Half-in, and half-out of the next realm. Seeks revenge against a world that caused it such pain. ‘Highly-active’, and mischievous. Lamba, is said to be highly unpredictable. And the seller, as part of the conditions of sale. Waves any and all responsibility - for any harm caused to the new buyer (i.e. me). Up to, and including, loss of life. Conditions I perhaps foolishly accepted by hitting the ‘Buy-It-Now’ button. And so now Lamba sits, on a chair in the corner of the room (which seems to be the optimum position for witnessing doll-based paranormal activity - if you believe the YouTube videos). And here i lie, watching it. Waiting for it to come at me. Unwilling to be caught off-guard, and unprepared. At least that is, until sleep grips me. Affording it the chance to slip down from its chair whilst I slumber - and choke me while I sleep. If you haven't already, you should look up Annabelle the haunted rag doll. She's proper scary! A couple years ago my mother told me I had a clown town my dad got for me when I was a baby. It was old and dirty so she tossed it out in the garbage only to find it in my crib with me again. My uncle took it the dump and it never retuned. She says this isn't the whole story but won't tell me. Where Can I Find the REAL Ring Video Online?